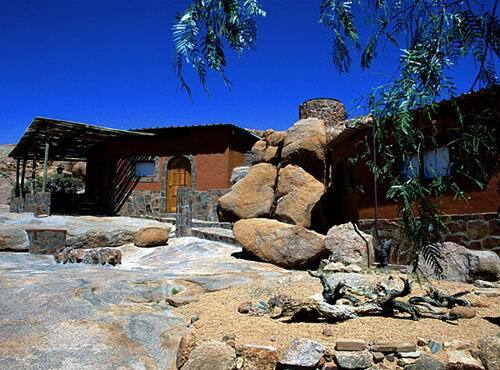 Koiimasis Ranch - In the midst of the Tiras Mountains, and on the edge of the Namib Desert is picturesquely surrounded by red shining granite rocks. 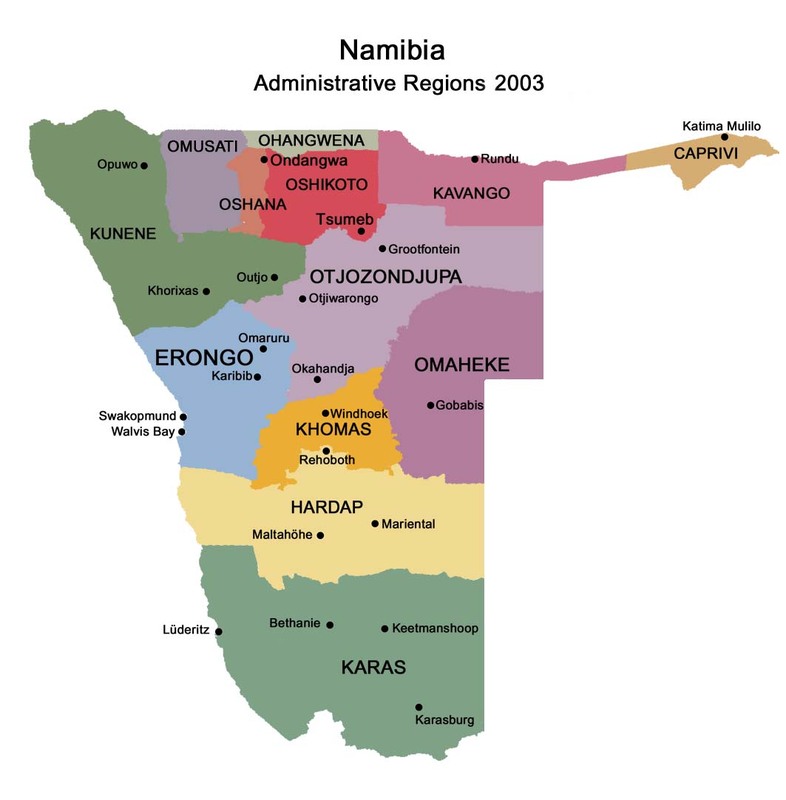 The name "Koiimasis" means "meeting point" and comes from the San people (bushmen) who lived here in former times. 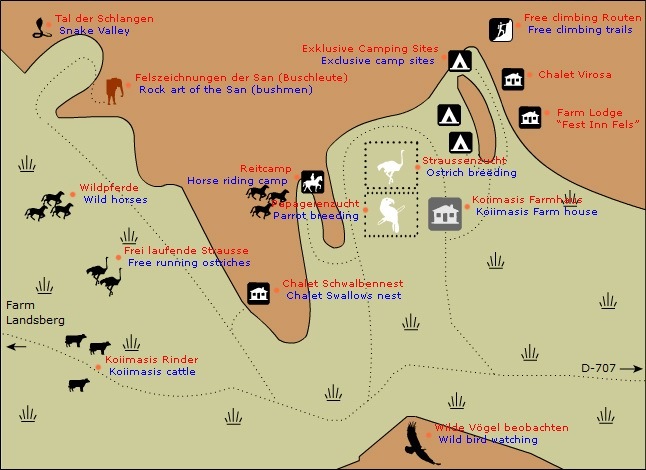 The landscape varies from desert to quiver tree forest and may be explored by car, on foot or on horseback. Nearly every day ends with an impressive sunset, followed by an unforgettably clear, nocturnal starlit sky. No light pollution here! 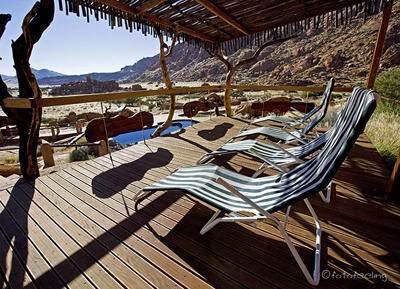 This is the best place to relax for a few days when travelling between Sossusvlei and Luderitz. 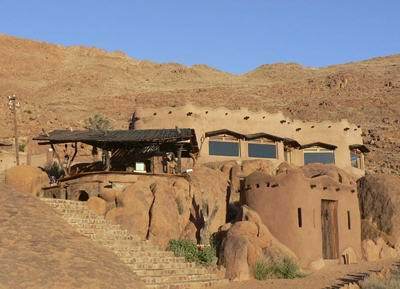 At the edge of the Namib Desert and within the triangle of Fish River Canyon, Sossusvlei and Lüderitz the 125 000 ha "Tiras Mountains" Nature Conservancy is located. 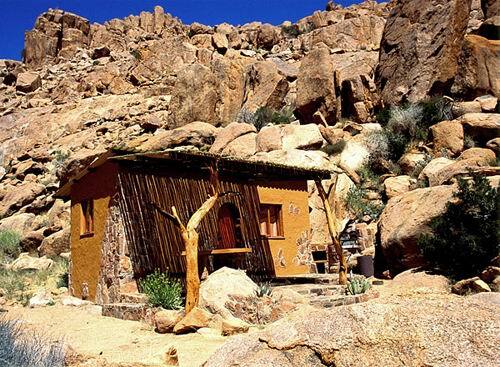 Here, a group of local farmers combined, to create a hideaway for nature lovers in one of the most beautiful areas of Namibia. Hosts invite you to enjoy the vastness and variety of our beautiful landscape. 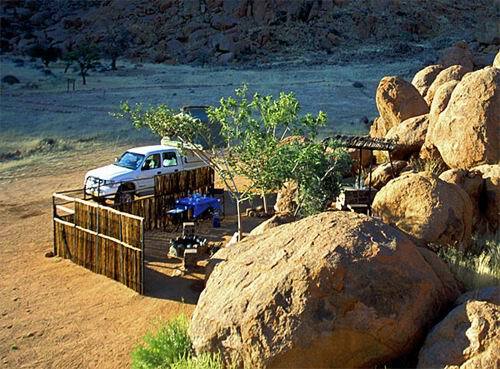 Join a guided 4x4 dune and mountain tours, nature drives on all farms, a walk through the ostrich farm or fascinating excursions - rock paintings, the quiver tree forest, bird and game watching, desert walks. 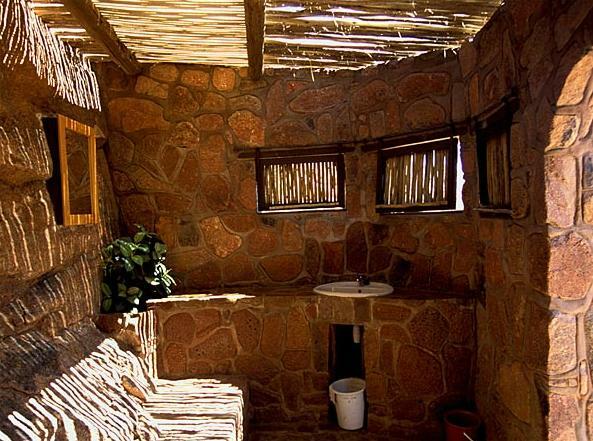 They offer country style hospitality in cosy chalets or exclusive camping in the midst of red granite. 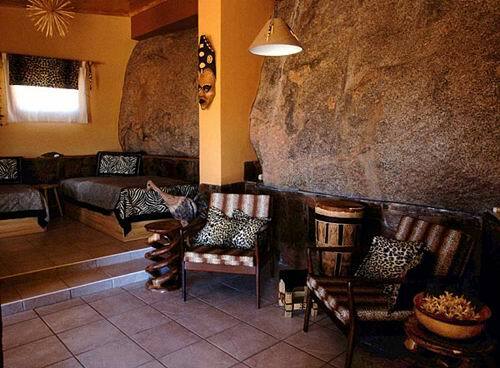 This is the place to spend a few relaxing days away from anywhere. 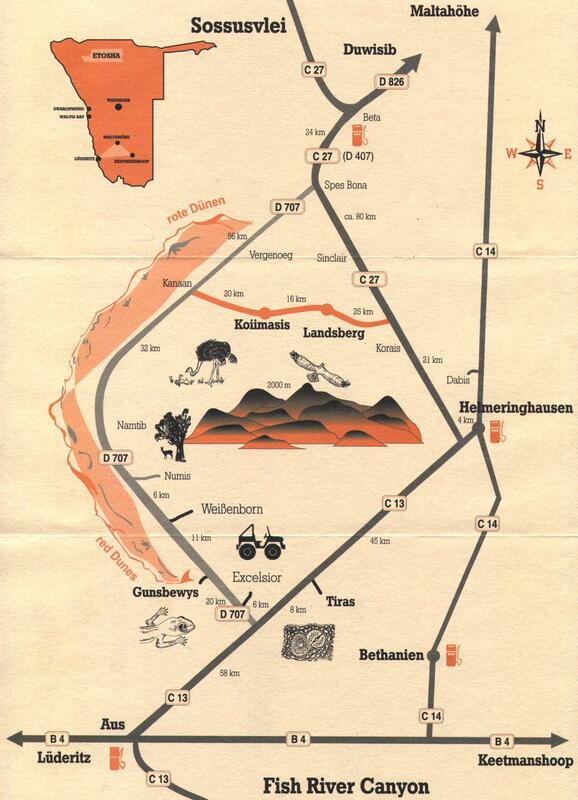 Part of the "Tiras Mountains Conservancy" are the farms Landsberg, Koiimasis, Tiras and Gunsbewys. 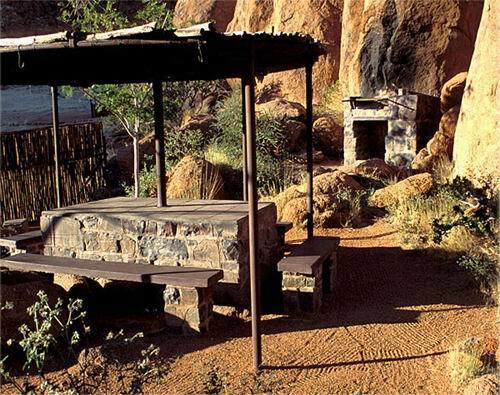 For individual travellers and nature-loving self caterers the ranch offers various accommodation options: several exclusive camp sites or two secluded chalets - equipped with all conveniences and tastefully furnished. 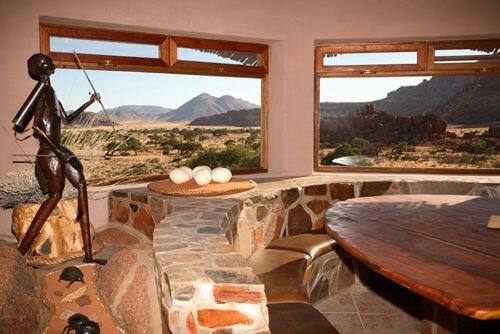 Dinner can be arranged by appointment at the Farm-Lodge, either with pre-bookings or no later than 10:00 a.m. 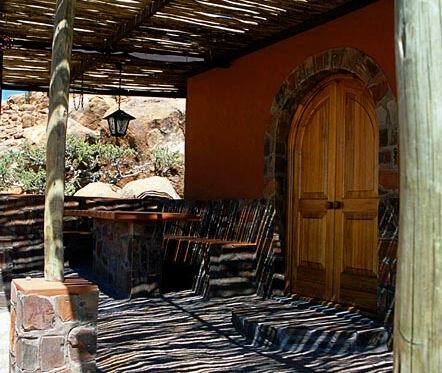 The Fest Inn Fels Farm Lodge consists of 4 chalets, restaurant, reception, pool, mountain-terrace and Sky Bar. 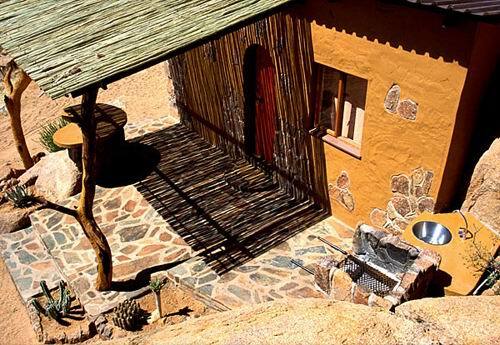 Schwalbennest is a privately situated chalet, fully equipped open plane kitchen, 2 beds, separate bathroom, and an outdoor grill facility - ideal for honeymooners (minimum 2 nights). 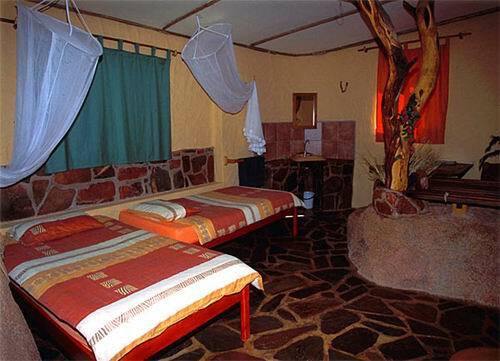 The Chalet Virosa is a "low budget" 2 beds room situated near the camp ground for self sufficient self-caterers and offers an outdoor grill facility only. Sharing bathroom. 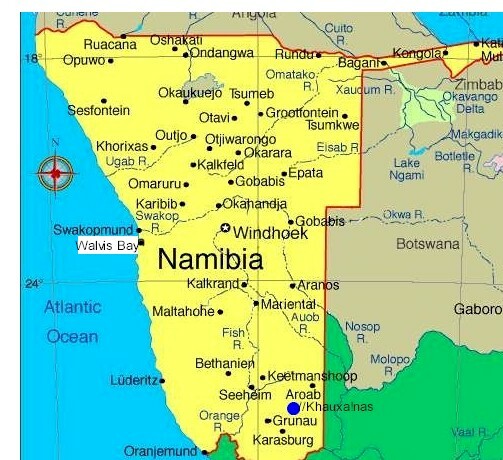 Rates are subject o change without prior notice should tax be increased or Government levies introduced. Rates include Value Added Tax.